Routledge, Marie. "Kiawak Ashoona". The Canadian Encyclopedia, 29 November 2016, Historica Canada. https://www.thecanadianencyclopedia.ca/en/article/kiawak-ashoona. Accessed 25 April 2019. Kiawak Ashoona (also known as Kiugak), sculptor (b at Tariugajak, Baffin Island, Nunavut 16 Sept 1933). Son of renowned Inuit artist Pitseolak Ashoona, Kiawak recounts that his own prodigious artistic career began in his childhood, while the family was still living at a camp on the land. 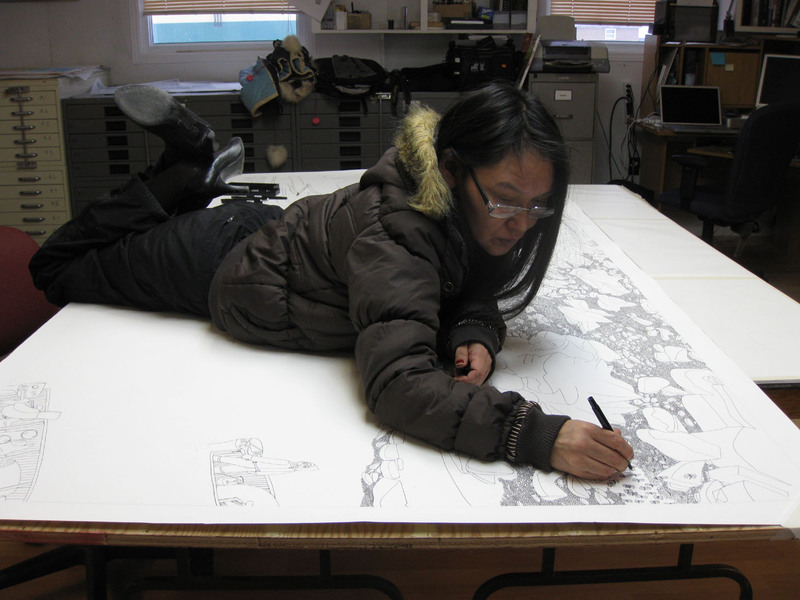 Kiawak Ashoona (also known as Kiugak), sculptor (b at Tariugajak, Baffin Island, Nunavut 16 Sept 1933). Son of renowned Inuit artist Pitseolak Ashoona, Kiawak recounts that his own prodigious artistic career began in his childhood, while the family was still living at a camp on the land. His first carving, made from walrus tusk, was taken by his brother Qaqaq Ashoona to exchange for supplies at the Baffin Trading Co. While focusing on typical Inuit subject matter - people engaged in traditional activities, mythological and fantasy creatures - Kiawak, who continues to maintain a camp home a short distance from Cape Dorset, Nunavut, earns his reputation as an artist for the dramatic power and formal beauty of his work. His sculpture of the Inuit sea goddess Sedna was featured on a 1980 Canadian stamp.